Kerry Group’s Global Technology and Innovation Centre brings together several de-centralised Food Development and Production facilities across Europe into one 23,500 m2 facility, making it one of the largest of its type in the world. Alucraft were appointed to design, develop and fabricate the entire building envelope. This included secondary steel, glass rooflights, roofing, twin skin façade’s, curtain walling, terracotta and Alcubond rainscreen cladding. Located in the heart of Dublin City Centre, No. 1 Georges Quay is the iconic former Ulster Bank HQ on the south bank of the River Liffey. Alucraft were appointed specialist façade sub-contractor on this extensive refurbishment. 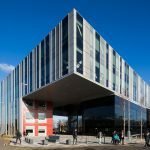 We were responsible for the design, development, testing, engineering, fabrication, logistics, delivery, co-ordination, installation and commissioning of all the new façade elements. From the outset, it was paramount to RKD Architects to secure a LEED Platinum rating for this building. This presented Alucraft with a challenge to develop an innovative open in twin skin solution. Alucraft in collaboration with Schueco UK and the Schueco Germany design teams to deliver this complex facade project. The iterative process required the design of bespoke details to meet with the architect’s visualisation and the delivery of the product to Alucraft within very tight program constraints. 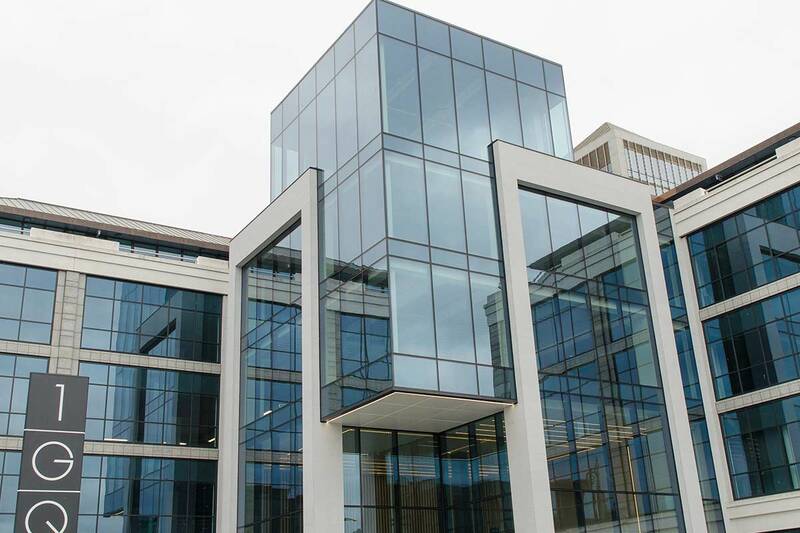 The main challenge for Alucraft was to join forces with Schueco’s technical team to design a window system with high thermal values and adapt it to unitised and twin skin, whilst also giving a ‘frameless’ look externally. This was achieved by adding a bulb to the front of the window system, forming a cavity casement around the perimeter to which a single monolithic piece of glass could be structurally bonded to. The main profile body was adapted into a unitised section based upon the Schueco UCC65 system so that the bespoke AWS90 system could benefit from its CWCT test cert, thus negating the requirement for the client to test which programme did not allow. The AWS90 utilised the UCC65 bullet gaskets as well as the trademark saddle gasket; which has been extensively tested to CWCT standards elsewhere. A full CFD analysis was carried out to determine the ventilation requirements for the cavity within the twin skin. Attached to this report was also a full thermal analysis to establish the size, colour and degree of perforation of the venetian blind housed with the twin wall.